Our favorite vignette of the week… large abstract in white, grey blue and gold, $395, 52″ square. White designer lamps $131 each, 28″h. Gold mirrored server $625, 70x18x34. Just in…lovely brand new ivory chesterfield sectional, $1,695. 96×96. Shown with super on-trend glass top coffee table with gold base, $375. 36″diameter & 17.5″h. Great for back to school…rustic writing desk, $295. 60×23.5×31. Sailboat art, $225. 45×29. Stiffel lamp, $175. 31″H. We have FOUR of these black Pottery Barn dining chairs, $125 each. Sold in pairs only. This charcoal ‘chofa’ will NOT LAST, $695. 82×64. FYI, the chaise can be used on either side. Hand embellished textured floral abstract, $165. 40″square. This solid wood dining table is a steal at just $355. 72x40x30. Dark brown leather like dining chairs, $75 each. Six available, sold in pairs only. Round rustic coffee table, $345. 48″ diameter & 18″H. Queen ivory headboard with nailhead trim, $295. Diggin’ on these ‘Jeannie in a Bottle’ aqua lamps! Denim blue sectional, brand new for $895. 112×84. Blue chevron lamps, $85 each. 30″H. Vibrant bird painting, $295. 38×50. Coffee table $295. by Bassett, it retails for $588, our price, $295. Wooden bowl with succulents, $52. Another great rustic writing desk just $145. 47.5x24x31. Sailboat oil painting, $295. 48×37. $345 large scale 46″ square. A lovely and neutral beige sofa, brand new for $795. 90″W. Floral recliner in a pretty blue and green upholstery, $450, 36″W. these abstract florals… $95 each. 27×33. Glass bottle-green lamps, $95 each. 27″H. Great looking taupe sofa with wood trim, $595, 82″W. Coordinating loveseat available, $495, 60″W. Chinese wooden coffee table, $445. 58x30x20. Ombre designer lamps, $139 each. 29.5″H. Abstracts $95 each, 30×30. Round mirror $196, 45″ diameter. Just in on consignment…a genuine leather sofa with baseball stitching, very comfy and in excellent condition for $695. 92″W. Cute shabby chest, brand new for $395. 43x16x35. Floral abstract with fun colors, $125. 40×24. We have a pair of these octopus lamps, $95 each. Cute little owl, just $11. Resin wicker dining table with two chairs, $145. Table is 25″square & 30″H. Also just in on consignment…. 24″diameter. $145 for the set. $350. 44x44x27.5. It is not coffee table height, nor dining height, but the perfect size to put in between a pair of club chairs. Upholstered club chairs, $395 each. 30″W. Get a great deal on this tangerine recliner by Best in excellent condition for just $295. Sorry, pillow is sold. Super dramatic koi companions…$145 each, 22×42. just $42 each. Sold as a pair only. A closer look at these abstract companions, $95 each. 30″ square. Wowza… loving this great vignette! Blue oversized slipper chairs $295 each. 26″W. Console retails for $799, our price $225! 48x16x32. Gorgeous hand embellished abstract art, $295. 51.75×41.75. A closer look at this wonderful hand embellished abstract art, $295. 51.75×41.75. Smaller scale sofa $495, 74″W, loveseat $425, 52″W. Indoor outdoor pillows, $32 each. Modern recliner $495. 30″W. Round coffee table with glass inlay, $175. 175″diameter & 19.5″H. 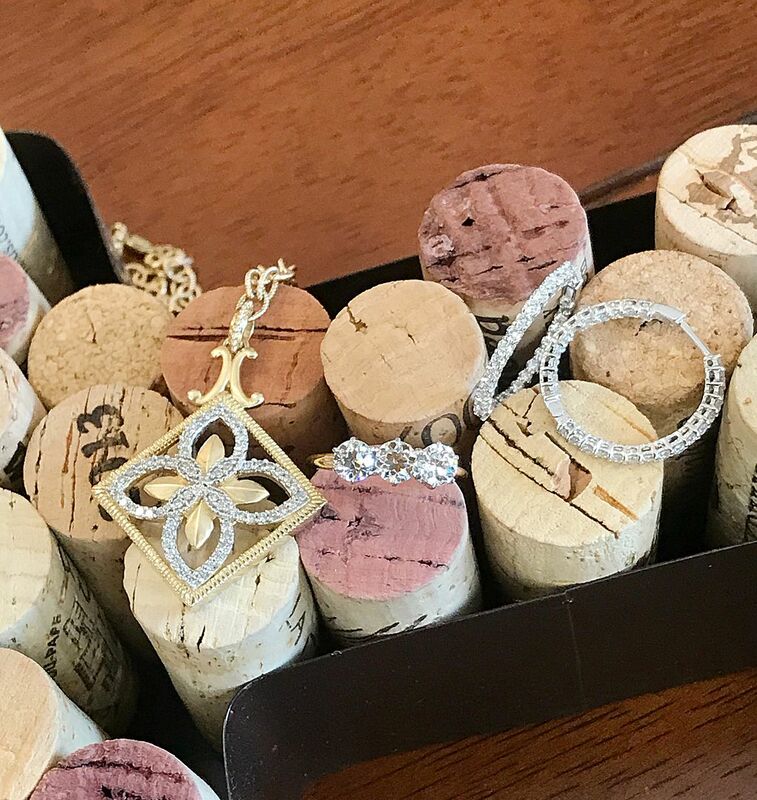 Looking for a GREAT wedding gift? Gorgeous Kate Spade for Lenox turquoise and lime bowl retails for $180, our price $75. 6″H. Never used, still in in box. When you come off the beach, stop by and grab this cute surfboard coat or towel rack! 30×10, Just $24! Sorry, striped pillows are sold. Hand embellished floral companions with a great color combo of turquoise and navy, $65 each. 17×29. You might need this over the weekend! Large drinks bucket just $24. 20.5×11. Just in on consignment…set of four nice black and white sea scapes framed in black, $75 each. 19.5×23.5. Two vertical and two horizontal format. The ottoman is a slightly different color than the glider in this genuine leather set by Dutalier, so it’s PRICED TO MOVE at $125. Check out these reduced consignor pieces! 10.75mm 14kwg hinged bangle. Was $495, now $275. 2.50ctw diamond dangle earrings in 14k rose and white gold. 11.75mm Tahitian pearl set into 18ky gold. 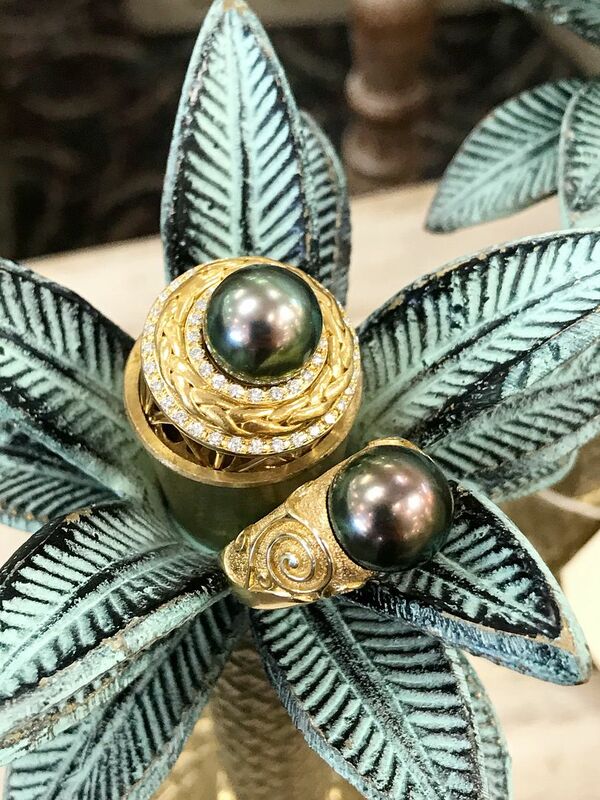 12mm Tahitian pearl with .50ctw diamonds in 18ky gold. 5ctw multigem ring with .40ctw of diamonds in 18ky gold. and they are now $675 a piece. 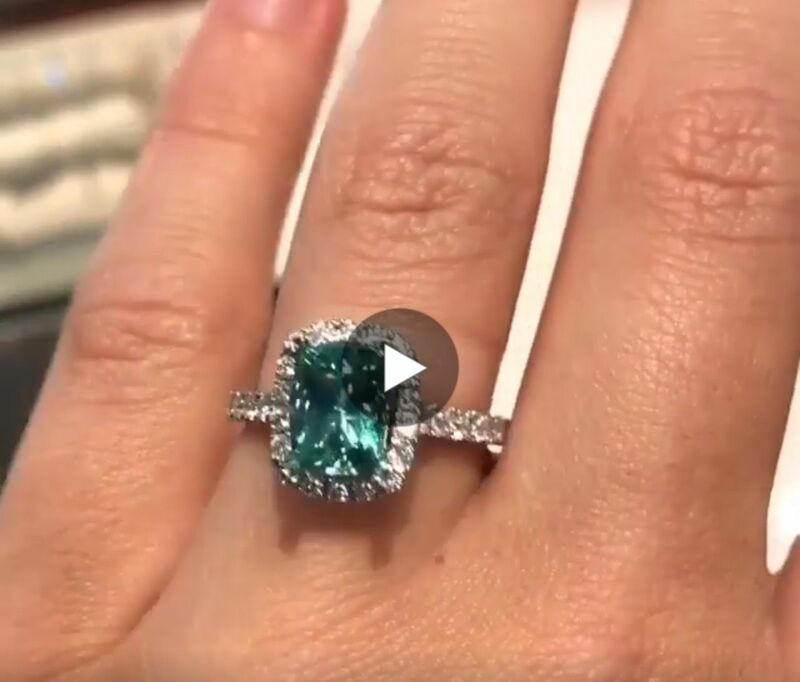 Fall in LOVE with this 1.64ct Afghan tourmaline, $1,025. Shown in a .80ctw diamond semi-mount, $2,835. Click the picture to view a video. 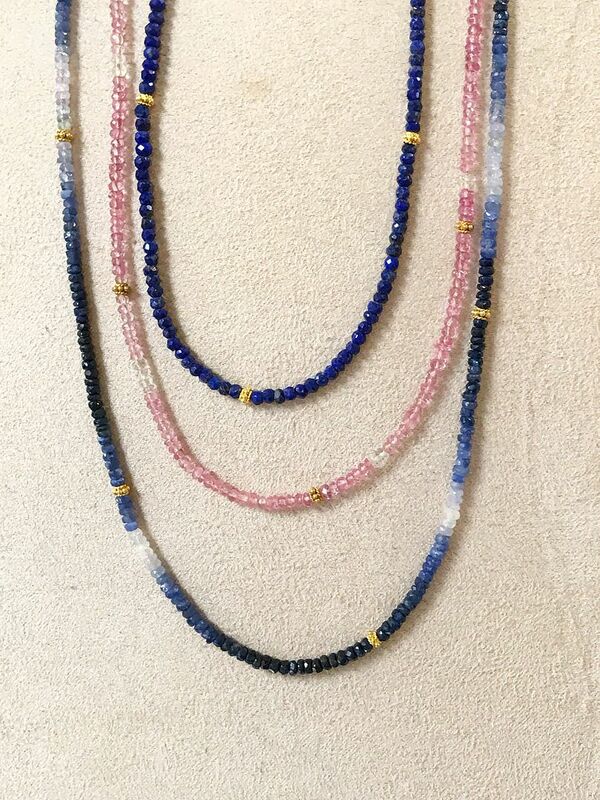 We love these Nina Ngyuen necklettes! 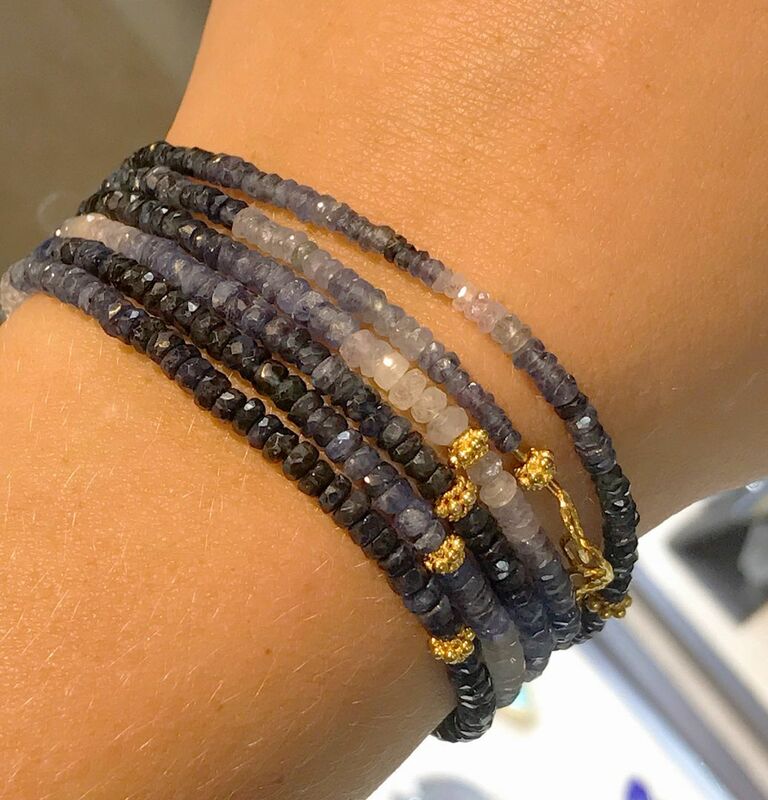 They can be worn as necklaces or wrap bracelets, as pictured below. Click this picture to shop all of our Nina Ngyuen pieces. 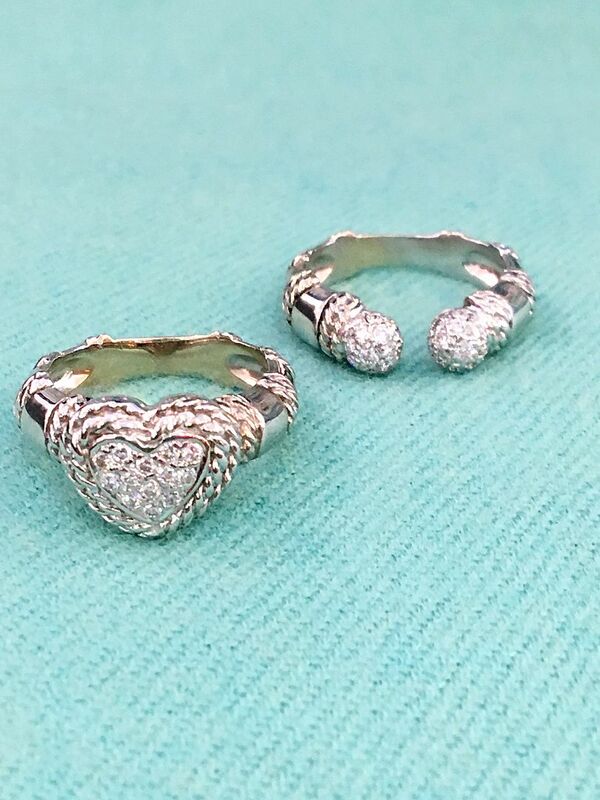 Charles Garnier sterling silver cuffs. 16mm matte finish cuff, $295. Mother of pearl, blue topaz, and cz bangle, $395. Sparkle and shine with this 1.01ct G color SI1 clarity round diamond, $7,275. Shown here with a .28ctw and 14ky gold setting, $1,295. 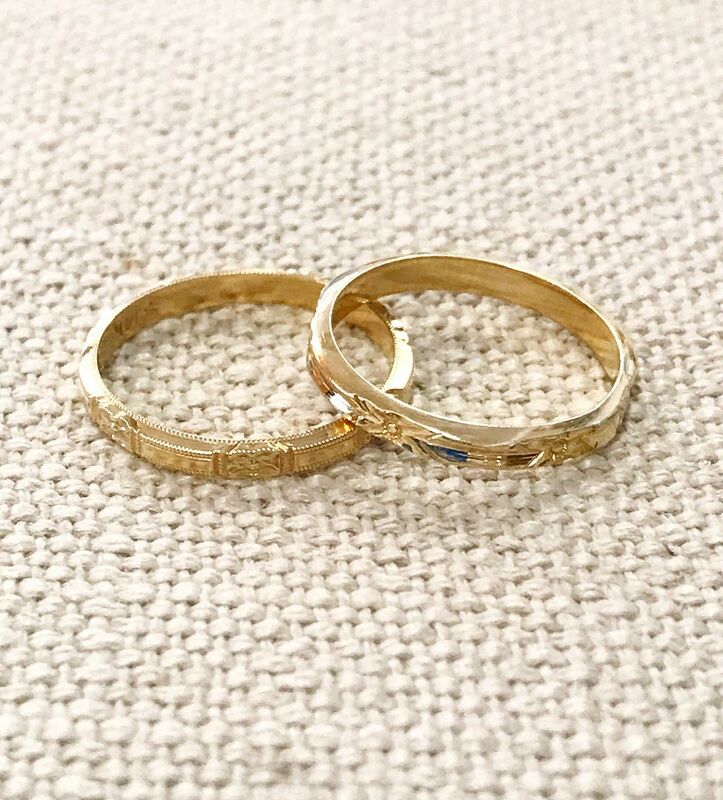 Antique 14ky gold wedding bands, a SUPER BUY at $95 each. Raymond Mazza .83ctw diamond ring in 14k green gold, $2,995. 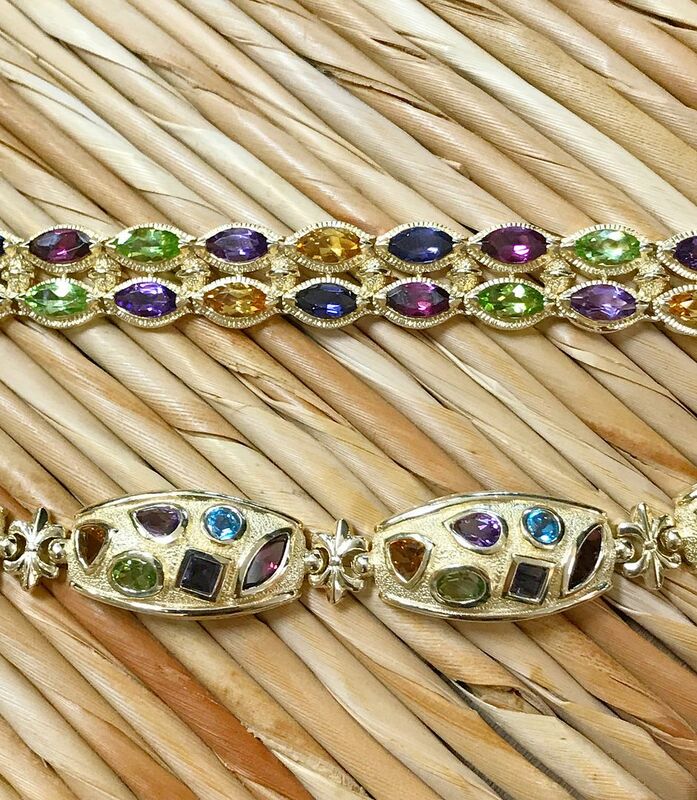 Top: 25ctw multigem bracelet in 14ky gold, $1,195. Bottom: 15ctw multigem bracelet in 10ky gold, $1,095. So unique…imagine wearing this with a little black dress! 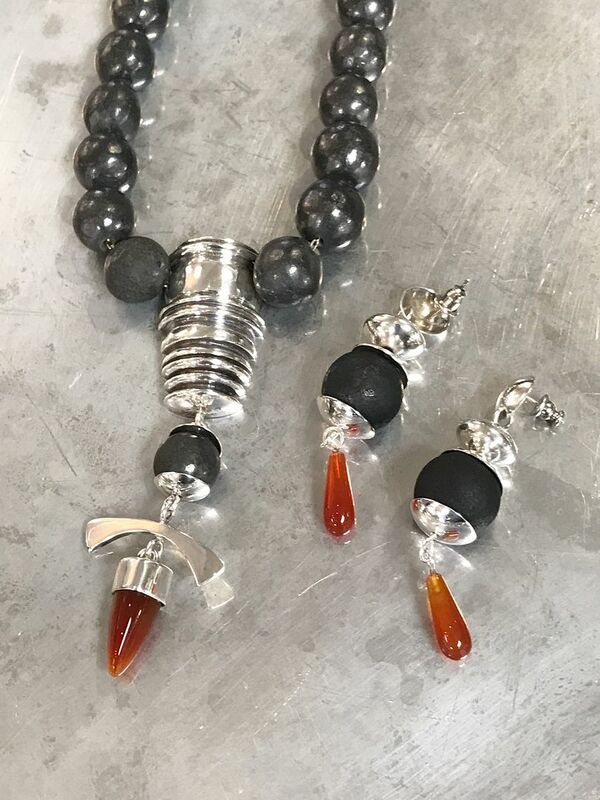 Matching ceramic, sterling silver, and carnelian set. 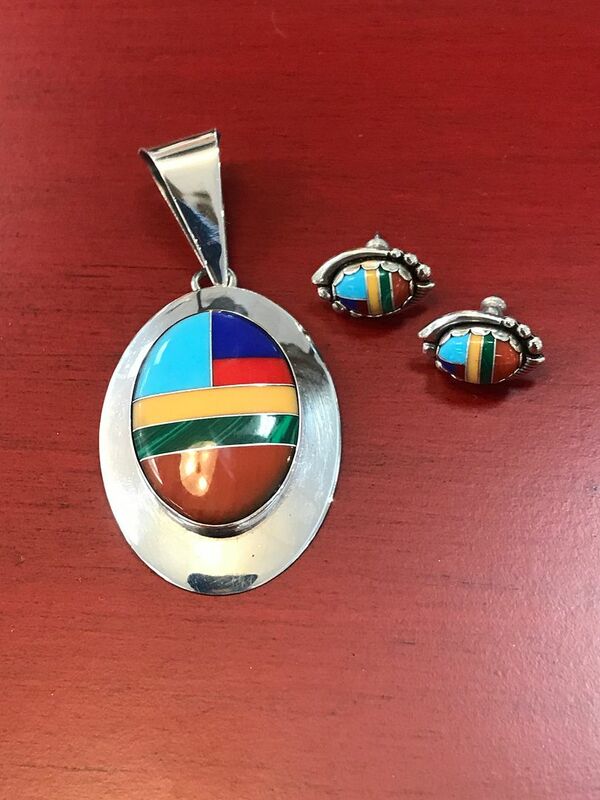 Multi-stone inlay in sterling silver. 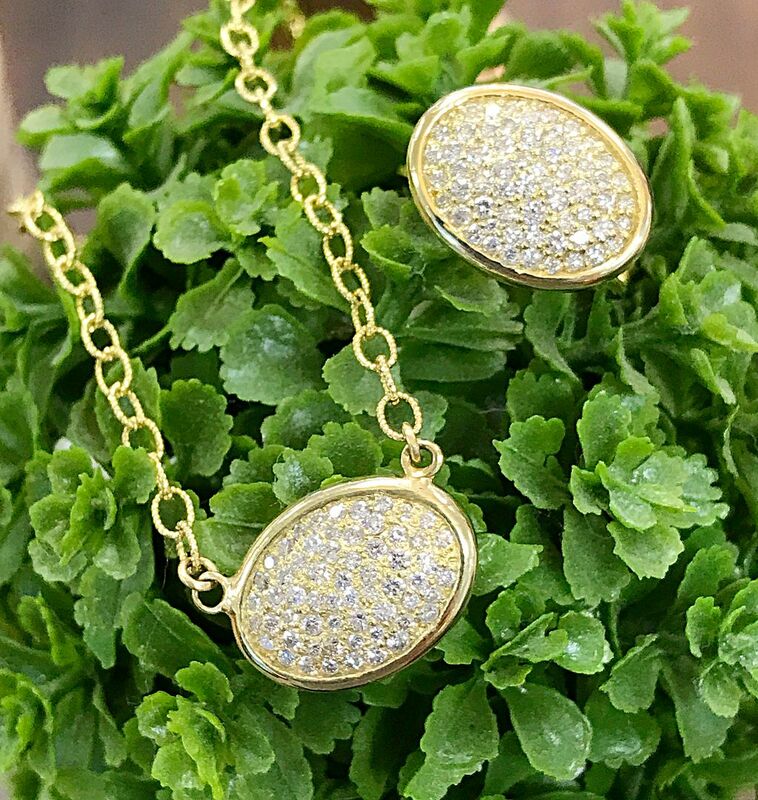 Diamond quatrafoil and14ky gold pendant, $1,195. 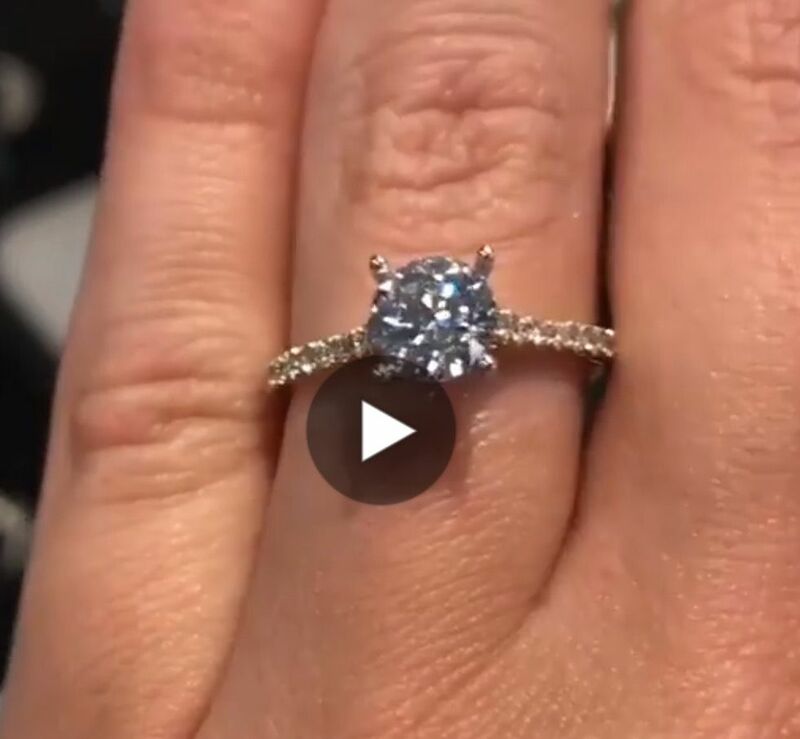 1.25ctw G color VS1 clarity three stone diamond ring, $2,995. 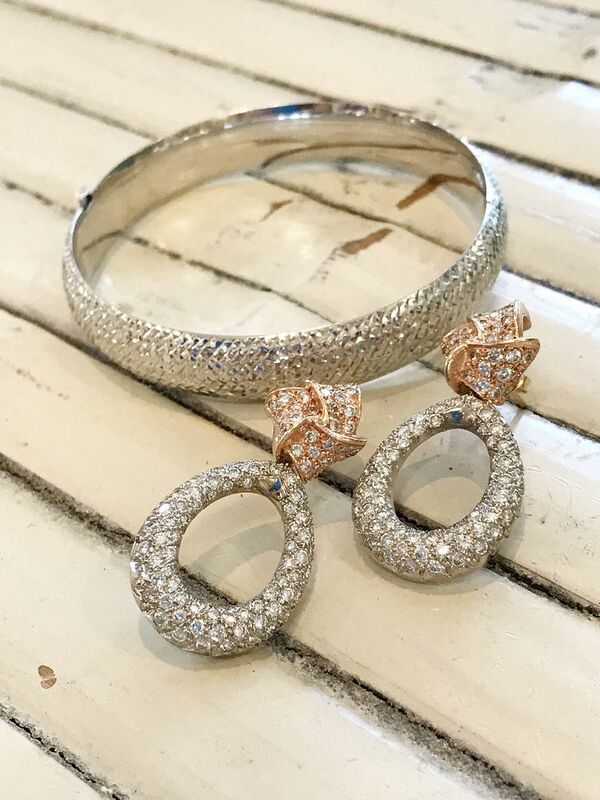 1ctw diamond inside out hoops in 14kw gold, $995. 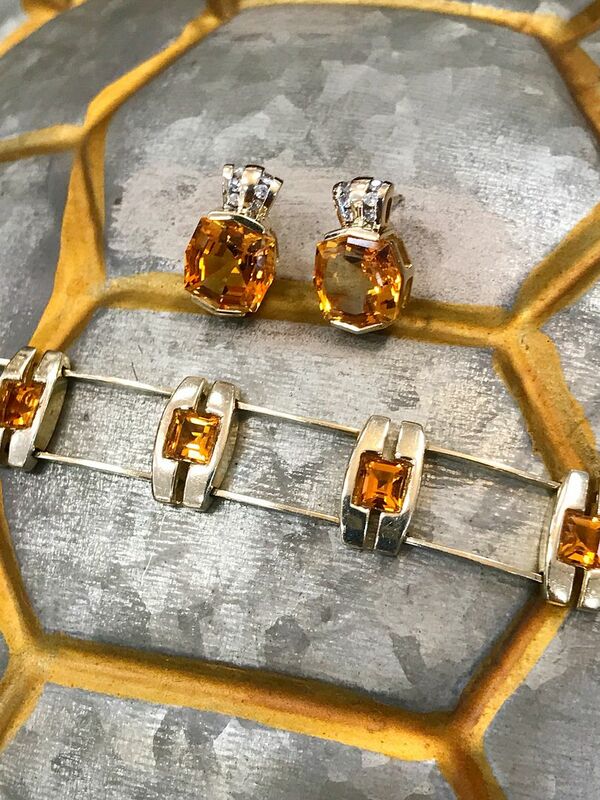 Citrine and diamond earrings, $395. Citrine and 14ky gold bracelet, $1,345. 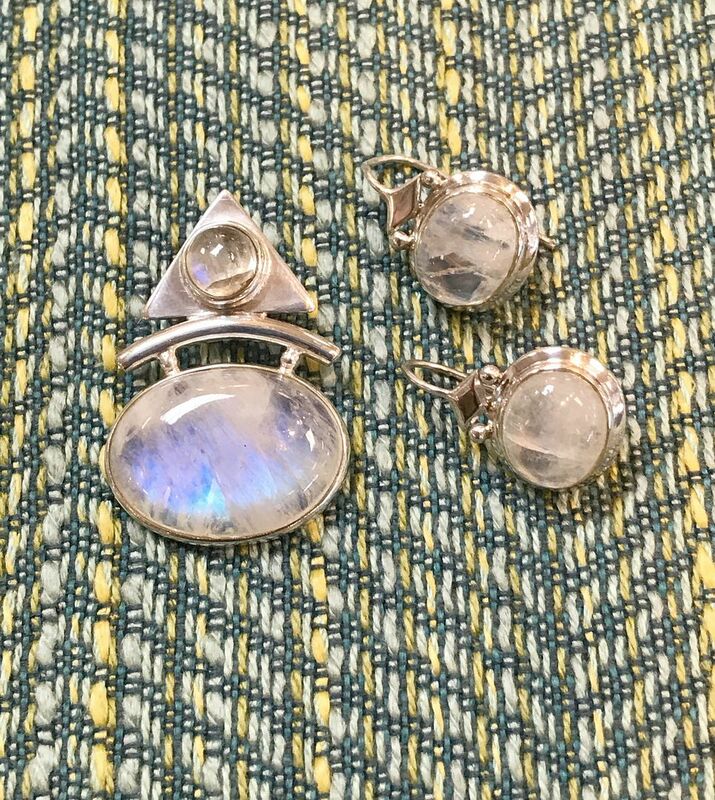 Moonstone and sterling silver matching set. 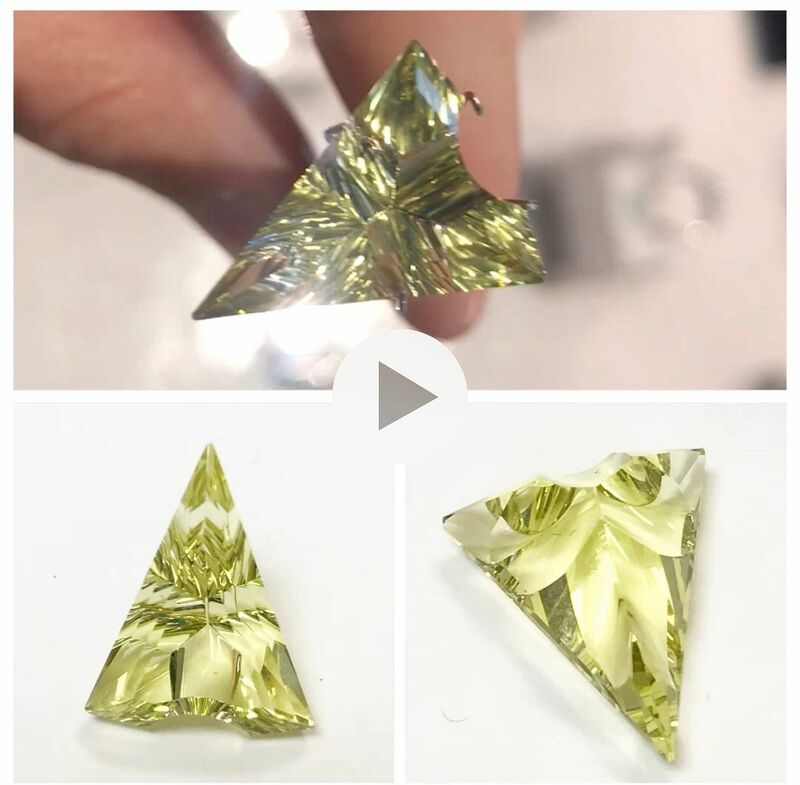 17 X 14 mm 7.28ct Oro Verde citrine. $335. Cut by award winning gem cutter Chris Wolfsberg. 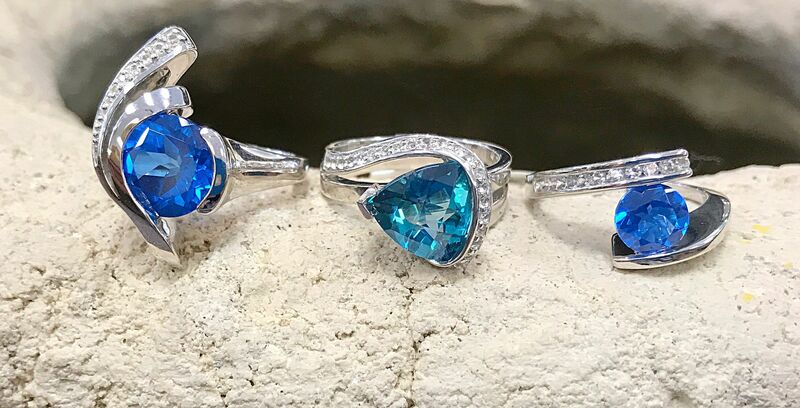 These Frank Reubel rings glow bright like the summer sun! All rings are sterling silver with white topaz accents. Left- Kashmir topaz wave ring, $395. 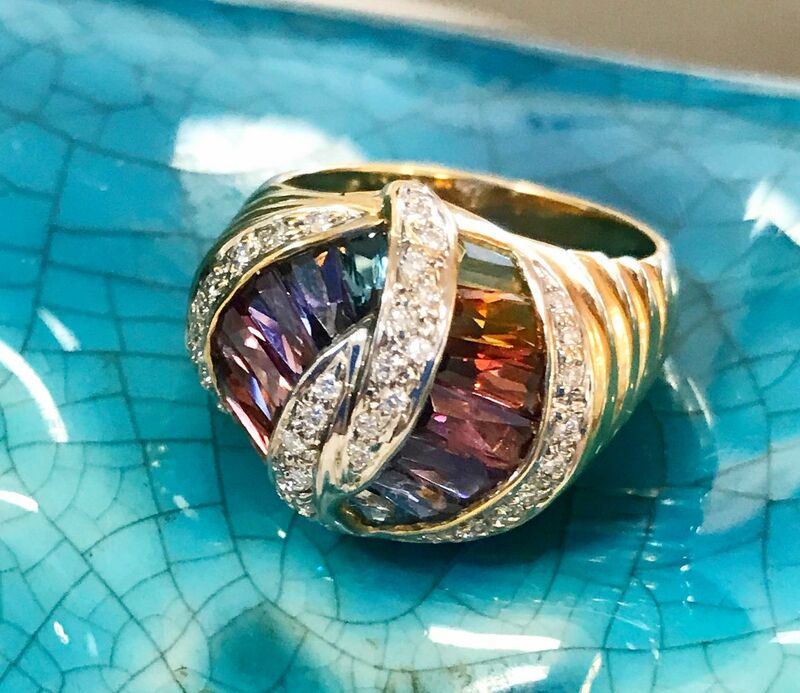 Middle- Caribbean topaz trillion ring, $425. Right- Kashmir topaz bypass ring, $335. 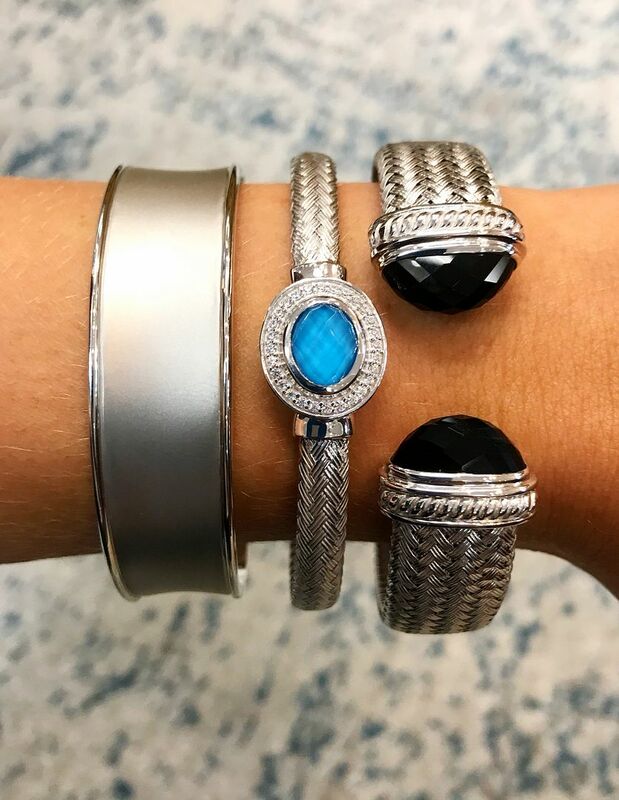 shop at Home Again & Lumina Gem!